Coils are often categorised in air core coils and core coils. Air core coils usually don't have a core (they might have a synthetic core without electromagnetic properties). Core coils have a core made of ferromagnetic material (ferrite, iron sheet etc.) to increase its inductance. Air core coils are best since they don't show any loss due to reverse flux. They often have the disadvantage of being too large at a given inductance and DC resistance. In this case, a ferromagnetic core has to be added to reduce the size. - Eddy-current loss due to the conductivity of the material. Both loss types result in sound degradation and not applicable to air core coils. The wire used for the coil possesses a DC resistance. Reducing the DC resistance by employing a coil in series to a bass driver, results in tighter and cleaner bass. The DC resistance doesn't cause any harmonic distortion and, therefore, sound degradation. Besides the reverse flux loss, the microphonics effect also plays a role in all types of coils. c) using a foil coil. The table below shows which coil works best for a specific driver type. Please note: the coil's polarity is of no importance! 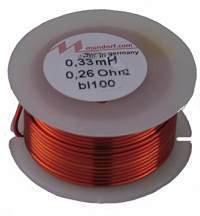 All above coils are made from copper varnished wire with a purity of > 99,99%. The bobbin is made of synthetic material. The wire ends are tin-plated and marked. The inductance is measured at 25 degrees Celsius, tolerance is +/- 5%. L denotes inductance, R is the DC resistance, D the diameter and H the height. All prices include German VAT. Please note: the values for Pmax were determined at 25 degrees Celsius ambient temperature at 50 Hz and with free convection. These are just ballpark figures! Since we are not the manufacturer we cannot guarantee the coils' measurement results. All coils supplied by us are made by Mundorf, Intertechnik and Monacor. *) Pmax 8 Ohm is the maximum power that this coil is able to deliver to the bass driver. The values are valid for free air convection and 20°C. 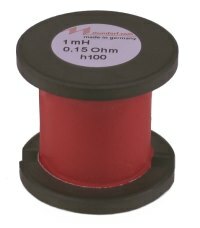 For 4 Ohm speakers this value has to be halved. The design of this coil type is similar to the air core coil, except that it contains a ferrite core. The vertical bar is resting partly inside the coil while the horizontal bar is covering the labelled side. The magnetisation curve is linear at small to medium volumes, meaning that distortion is low. 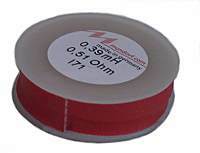 More H core coils (H71, H100, H140, BH71, BH100 and BH140) are on the H core page. Monacor transformer core coil with high power handling. The coil has OFC wire turns and is vacuum impregnated. These characteristics are available at an amazingly low price. This coil is also suited for subwoofers and bass drivers in hi-fi loudspeakers.